Increase your vocabulary and you’ll make your writing much more precise. That’s why I provide a word of the week. Today’s word: rick…. My father grew up on a farm but I was born a city girl. As a result, I had never heard the word rick. Until, that is, I read Up From Freedom, a novel about race and identity in the pre-Civil War U.S. by Canadian writer Wayne Grady. Now, in the evening, the heat of the day subsided, he was leading the horses from rick to rick while Rachel forked hay onto the bed, the sun’s low light slanting through the wheels. Loose hay would be taken to a dry storage area and built into a stack. The stack was made waterproof as it was built and the hay would compress under its own weight and cure by the release of heat from compression. The stack was fenced from the rest of the paddock in a rick yard, and often thatched or sheeted to keep it dry. When needed, slices of hay would be cut using a hay knife and fed out to animals each day. 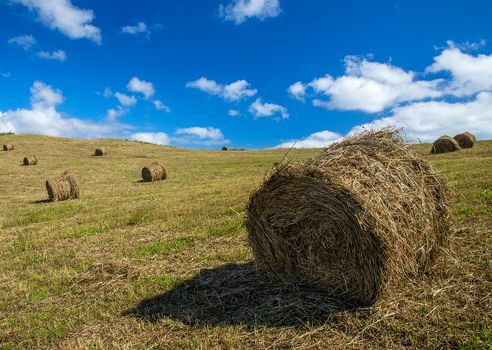 The etymology of the word is Old English, from hreac meaning “stack of hay or straw,” believed to have come from the Old Norse word, hraukr.